Khwai is renowned for its large concentrations of mammals and it is not unusual to see many different types of wildlife from the comfort of your own private deck. As a year round destination for wildlife, predators can regularly be seen in the area, rated as one of the most prolific in Botswana for viewing wildlife. The exceptional location of Khwai makes it’s a regular host to Elephant, Buffalo, Lion, Leopard, Cheetah and Wild Dogs. Birdlife can also be viewed in abundance with exceptional sightings of wildfowl and raptors near the lodge.Nestled on the edge of a leadwood and fig tree forest, overlooking the vast Khwai River floodplains and beyond into the Moremi Wildlife Reserve, sits the luxurious Khwai River Lodge. 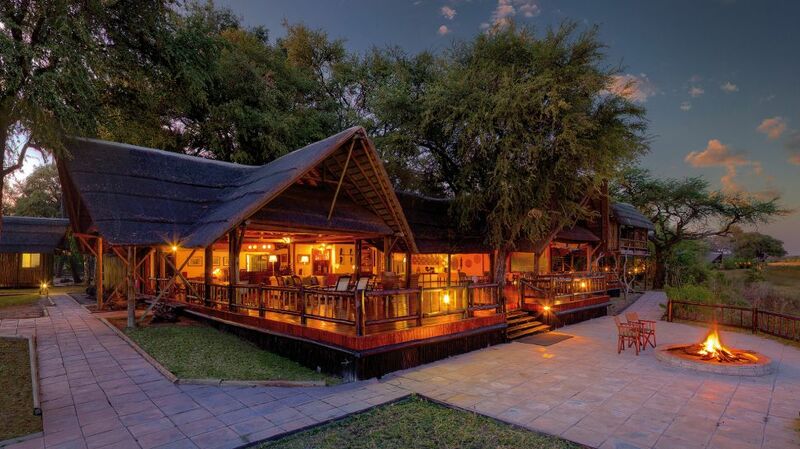 Khwai River Lodge is perfectly designed to blend into the surrounding environment. All 15 luxury tents are housed on raised wooden platforms, offering great views, and shaded by a traditional African thatch roof. The large private decks are furnished with easy chairs and a hammock, ideal for viewing wildlife, or for enjoying a private dinner in complete privacy. The tent interiors are luxuriously appointed with such comforts as an en suite bathroom, private fully stocked mini bar, four poster bed complete with mosquito netting, as well as a discreet air conditioning. Activities at the camp include morning and afternoon game drives in open Land Cruisers, as well as after-dark spotlight game drives. A cultural visit to a local village can also be arranged, as well as guided walks along the Khwai river. For the Adventurous, full-day private game excursions are also available to the nearby Okavango Delta where guests also have the opportunity to experience a boat cruise. For those wanting to relax, the lodge has a ‘Natural Wild’ gym and spa facility. Guests can enjoy indulgent massages and body wraps in the facility or in the privacy of their own tent.